As we enjoy Thanksgiving and express appreciation and gratitude, I want to thank family, friends, clients and readers for your support. Writing this blog has allowed me to connect with you on many topics. 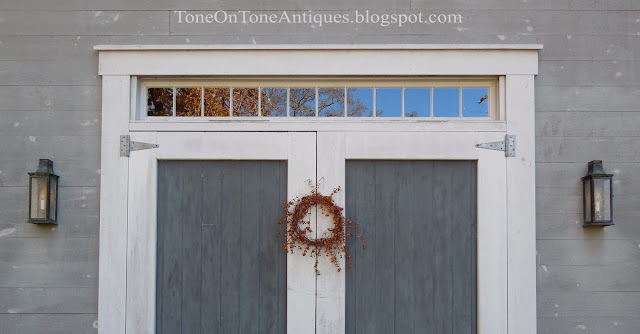 From antiquing to decorating to gardening, I have enjoyed sharing my point of view, and I cherish your visits and feedback. To celebrate this special time of gathering, I created a couple of seasonal arrangements using my favorite antique brown-and-white transferware pieces, dried flowers, and preserved foliage. Many thanks to my friend Ellen Seagraves for finding such unique floral items. Ellen, whose work I've featured here, is a fabulous florist. 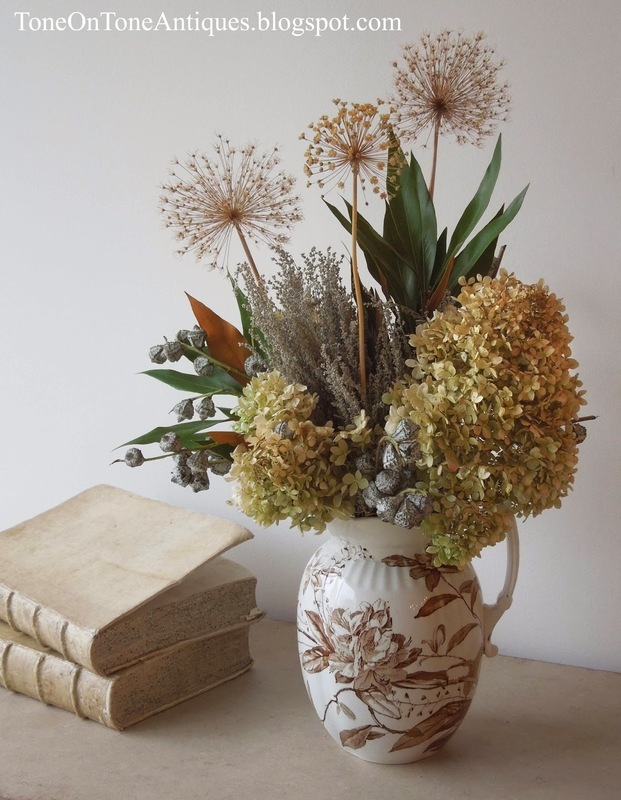 A bouquet of dried limelight hydrangeas, alliums, eucalyptus silver bell pods, artemisia, and grevillea leaves in a favorite brown-and-white transferware pitcher. The hydrangeas and alliums are from my garden. 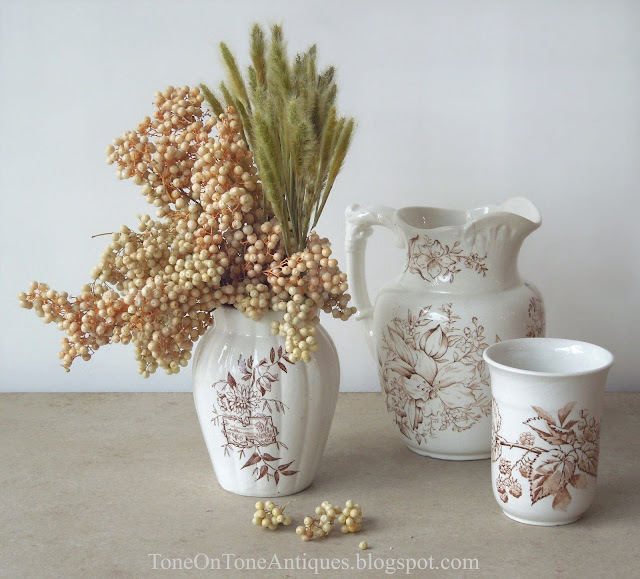 In this small brown-and-white transferware vase are dried cream pepper berries and bunny tail grass. -Style according to theme: color, subject matter, collection, etc. Example: displaying coral and shell collection at beach house. -Decide upon symmetrical vs asymmetrical (but balanced) approach. -Think about scale and proportions. 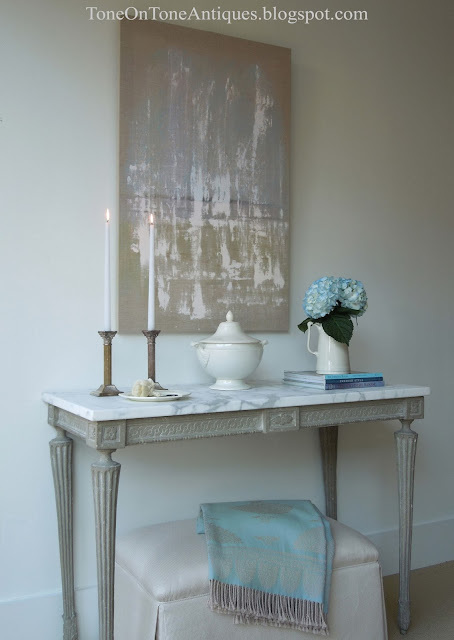 Don't be afraid to make an impact with oversize items. 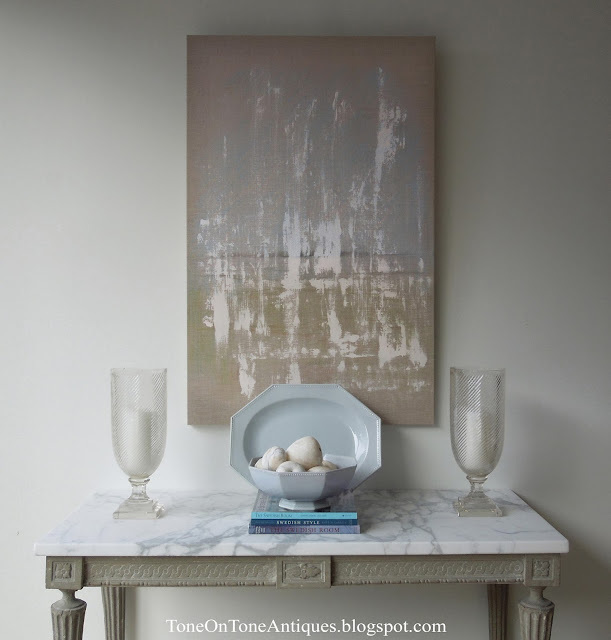 -Layer to create depth, and remember the space beneath. -Vary textures, and keep it interesting. 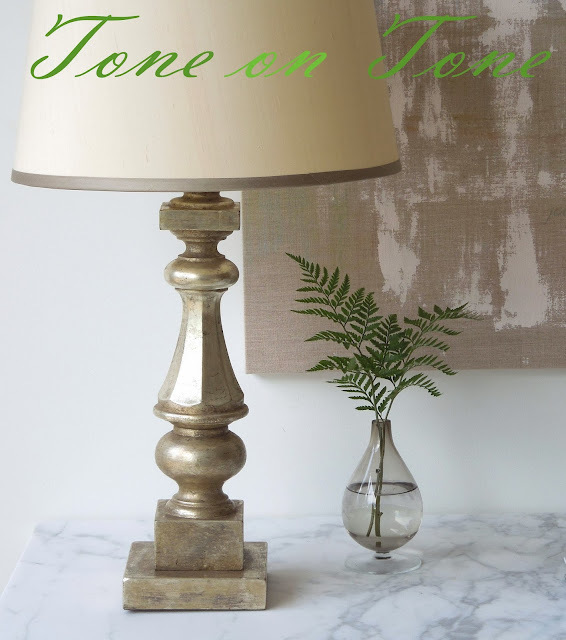 -Take the eye up with tall items such as lamps, candlesticks, etc. -Bring the eye down with small objects that capture attention and invite handling. -Remember function and purpose. 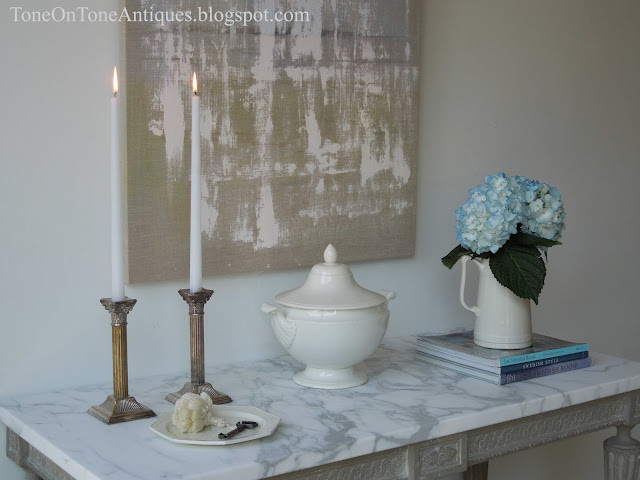 Does it make sense to display a silver tea set on a mudroom table? -Create groupings and clusters rather than many scattered items. 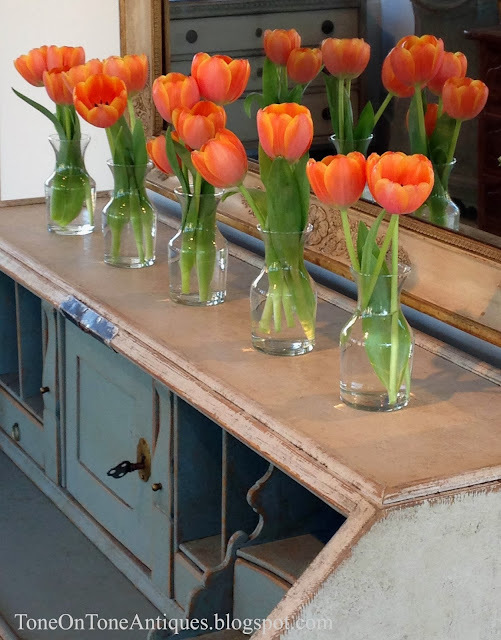 -Incorporate living, organic, and natural items like plants, flowers, pinecones, artichokes, etc. -Tell a story. 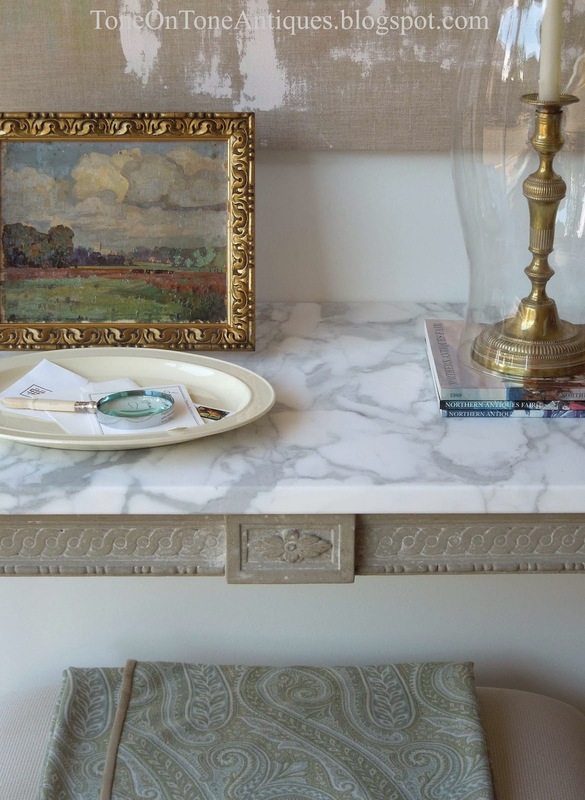 Accessories can be more than table fillers. 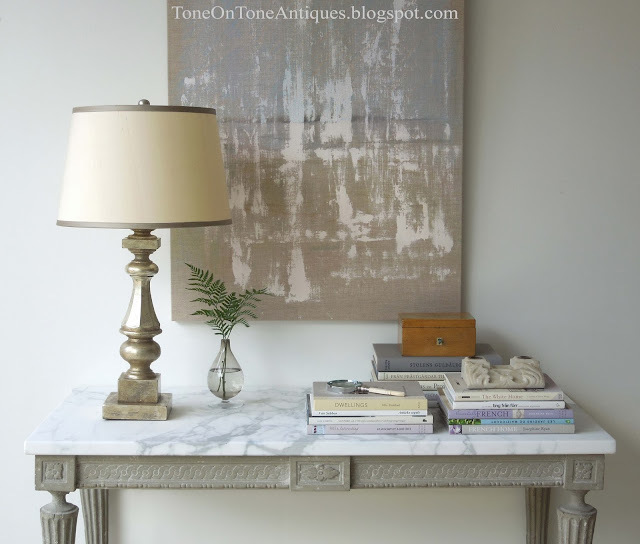 Use unique and personal pieces such as family photos and heirlooms, antique and vintage finds, objects from travels, etc. -Respect the negative space and know when to stop. 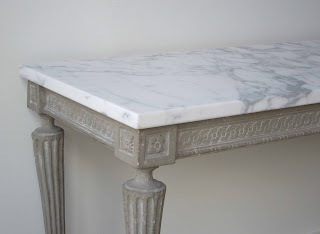 Now let's style this Swedish Gustavian console table! 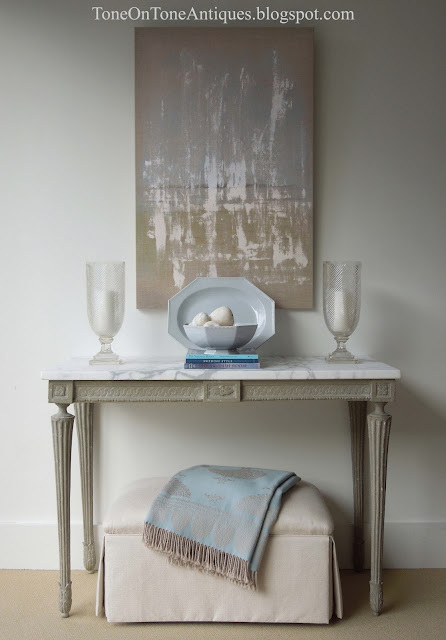 Vignette #1 - I styled this symmetrical vignette with antique blue creamware china appropriate for a dining or living room. On the console is a grouping of three, even though there are many individual items. 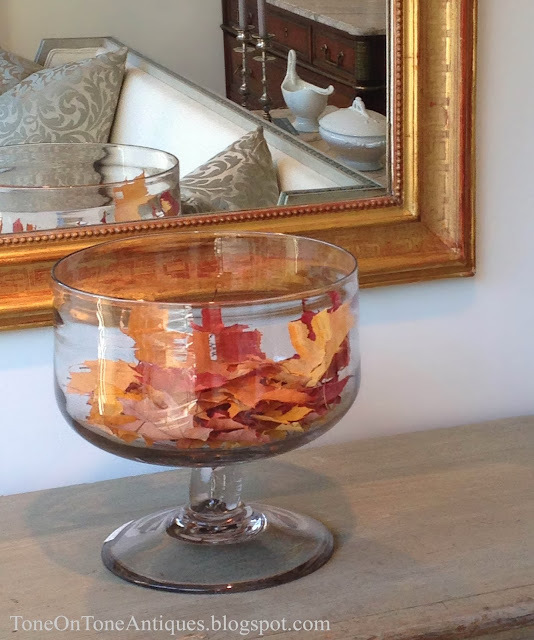 A platter is layered behind the bowl, which is raised on a stack of books. The vintage Italian stone fruit add texture and invite handling, while the pair of hurricanes take the eye up to the abstract painting. Underneath is a tailored ottoman with an asymmetrically draped throw - both add softness. There is an overall color theme of blues. 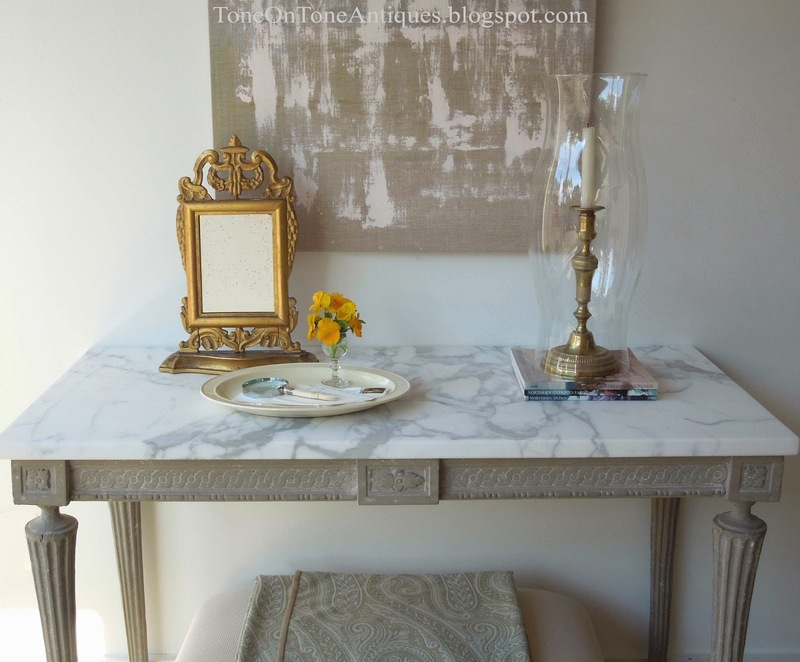 Vignette #2 - An asymmetrical but balanced vignette appropriate for the entry, living, and dining rooms. 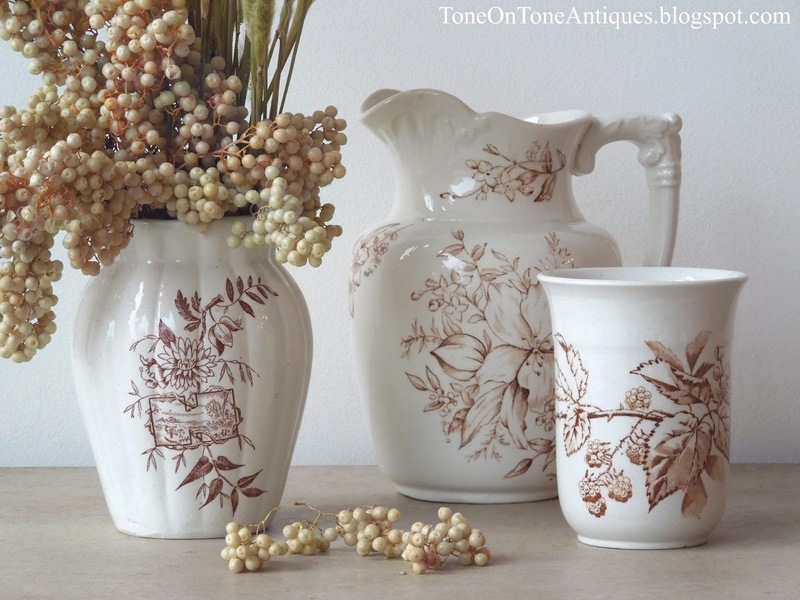 Notice the theme of creamware pieces, especially the little plate holding a key for, say, the front door, china cabinet, etc. In addition to being pretty, seasonal hydrangeas add freshness. Again, this is a grouping of three. Vignette #3 - I envisioned this simple tableau for a foyer or entry hall. 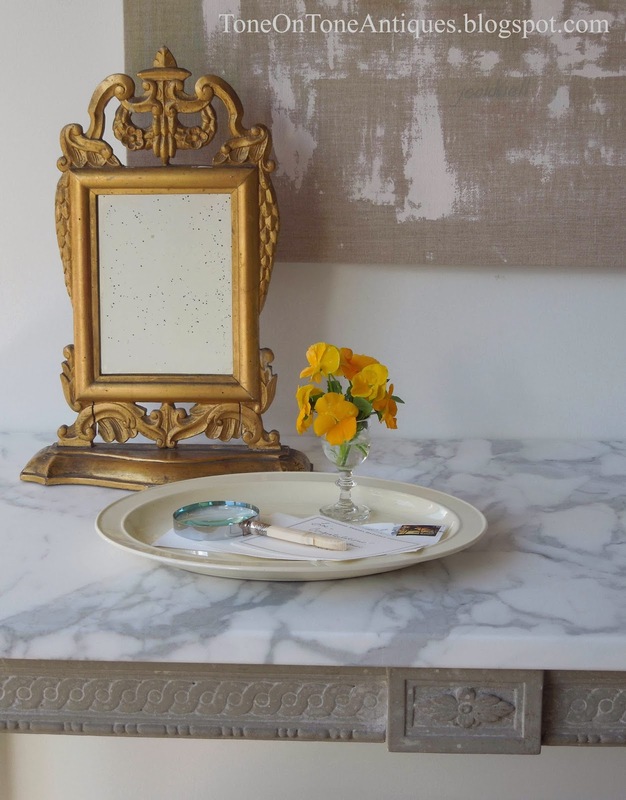 The grouping of two consists of a tall hurricane with candlestick, platter (or tray) to hold mail, and an antique dressing mirror for that last minute look before dashing out the door. Orange pansies in a tiny cordial glass are pretty while the antique magnifying glass is useful. 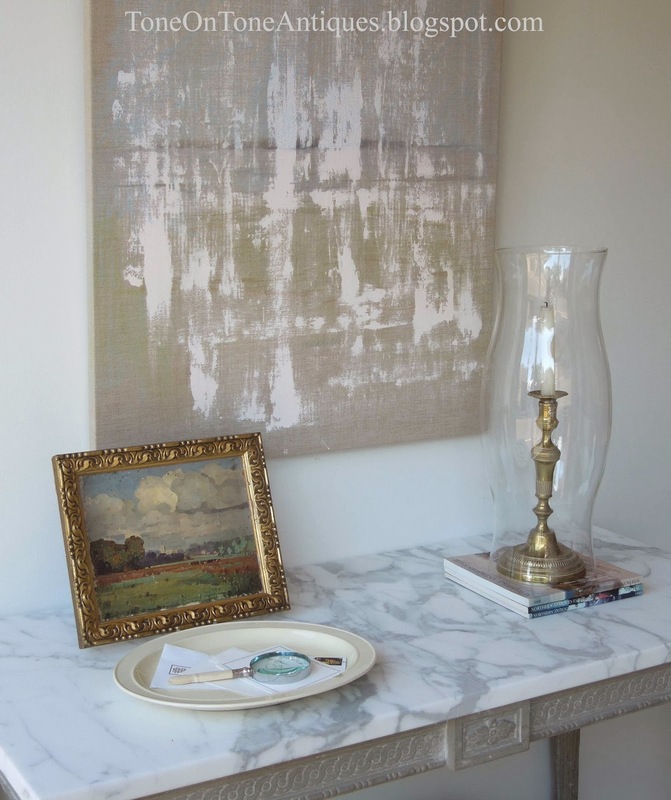 Below is the same vignette except a small painting replaced the mirror. Instead of a painting, framed family photos would be lovely and personal. Vignette #4 - Here, the console is styled with the living room, library, and study in mind. Many items are neatly arranged in two asymmetrical clusters. The scale of the lamp is balanced by the visual weight of the books. 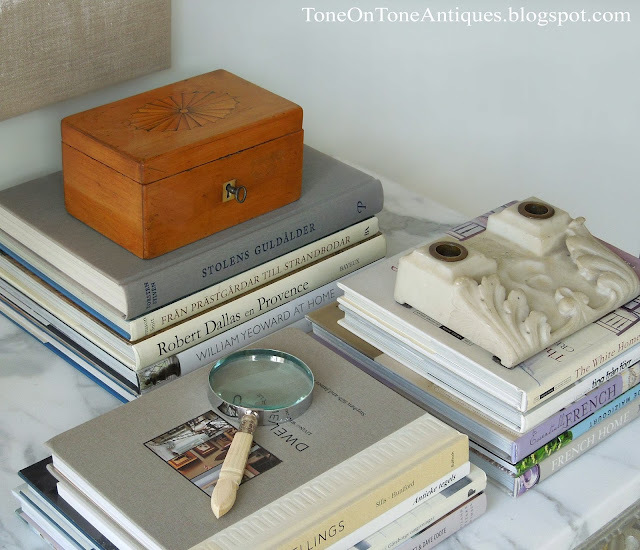 On the books are complimentary accessories such as a marble inkstand, magnifying glass, and fruitwood box - all antiques! 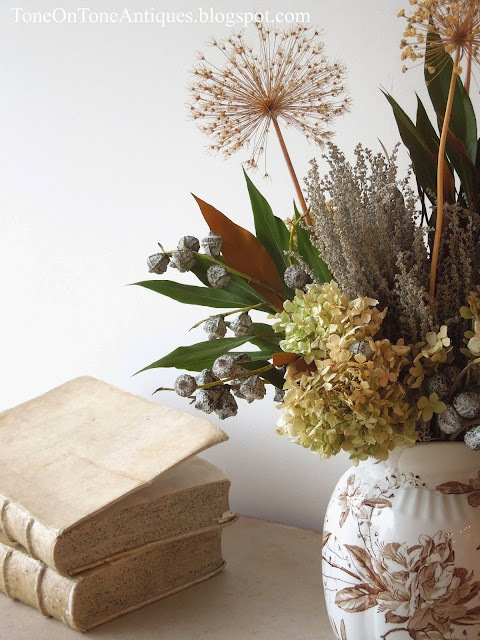 In lieu of flowers, ferns in a bud vase add an unexpected and organic touch. 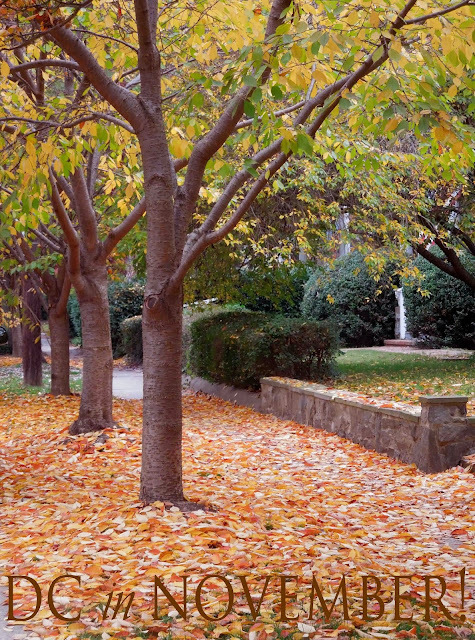 Flowers fade, foliage lasts. Vignette #5 - This last ensemble is simple and dramatic. 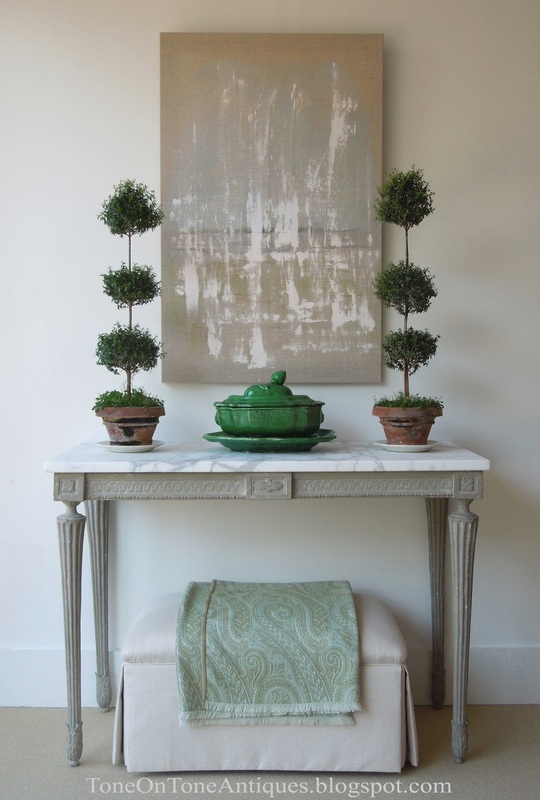 From the flanking myrtle topiaries to the French tureen set to the paisley throw, it's all about greens here! 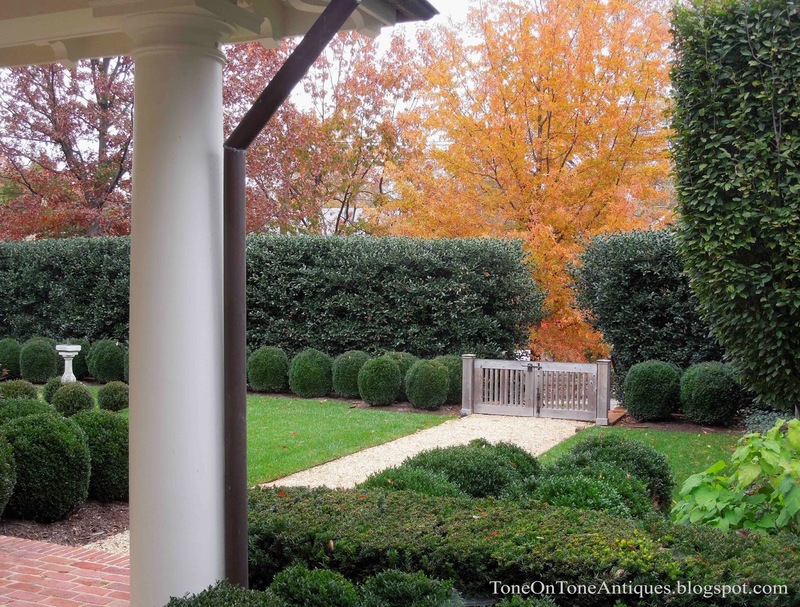 The topiaries take the eye way up while the unruly moss keeps them from being stiff and perfect. And that's the conclusion of my first accessorizing post. Anyone want to buy the console? I'll help style it! Outside our front garden is this glorious willow oak aglow in golds and russet tones. Notice how verdant, full and neatly clipped the hornbeam trees (to the right) are. 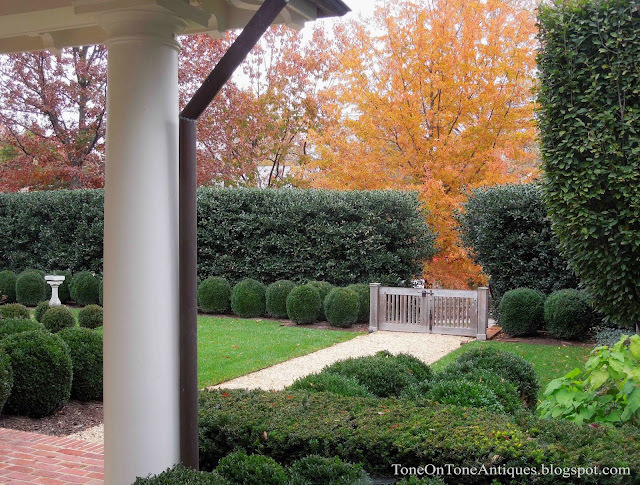 The leaves will eventually drop, but sheared hornbeams tend to hold their foliage well into January. To see them bare, visit here. 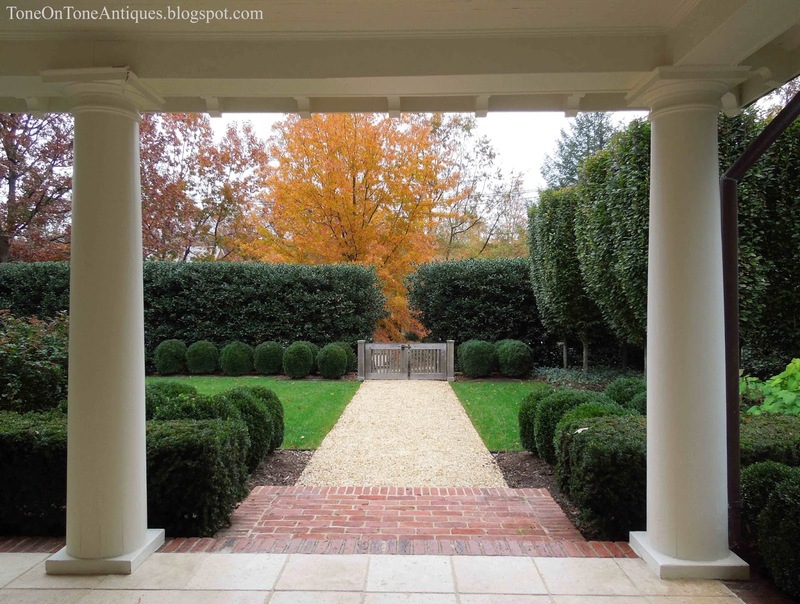 BTW, I'm letting the tops of the holly hedge (behind the gates) come together to form an arch. The hedge is sited on a hill so there will be plenty of overhead room coming up the steps under the future arch. Exotic orange tulips to brighten up a grey day at the shop. I thought the bittersweet wreath added a simple but festive touch to this grey barn in Maine. 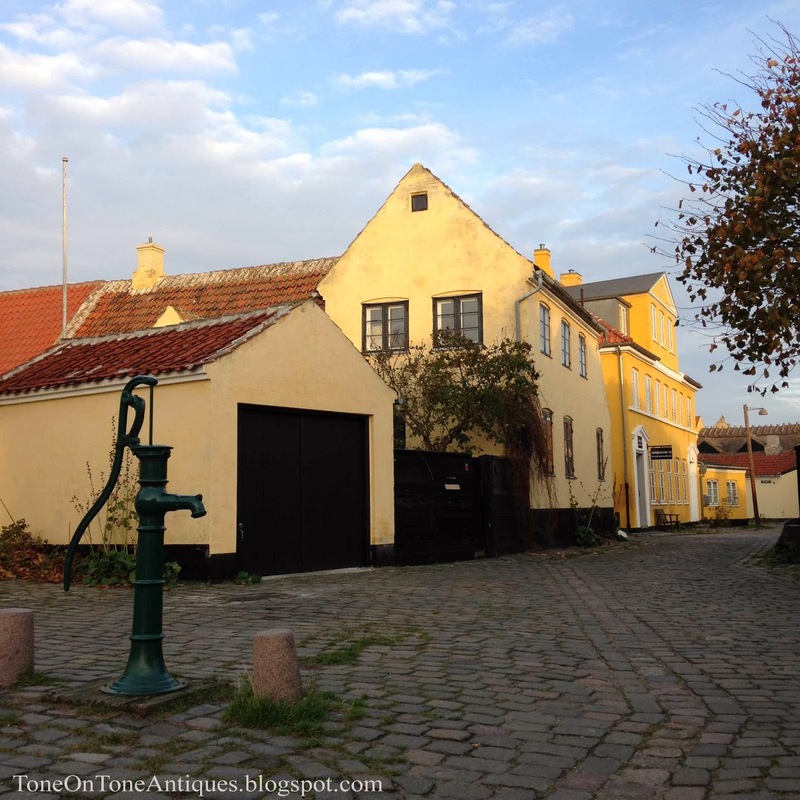 After several trips to Maine, we traveled to Denmark and Sweden. No photos of Sweden because it rained nearly every minute during our visit. 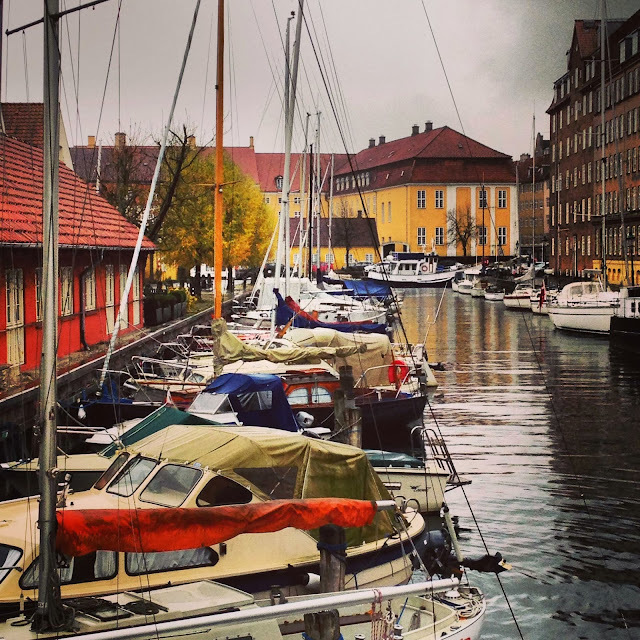 We did enjoy a traditional Danish lunch overlooking this lively canal in Copenhagen. Here comes the sun! 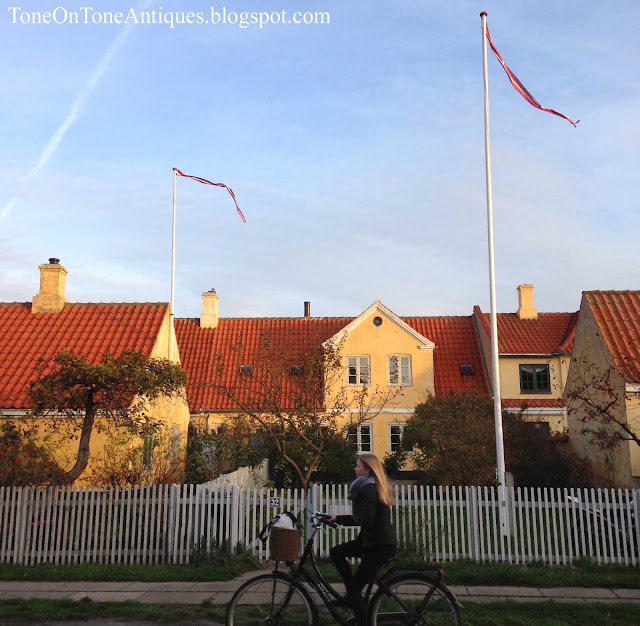 Love this shot of a blonde bicyclist riding through the old town of Dragor with the Danish banners flying. 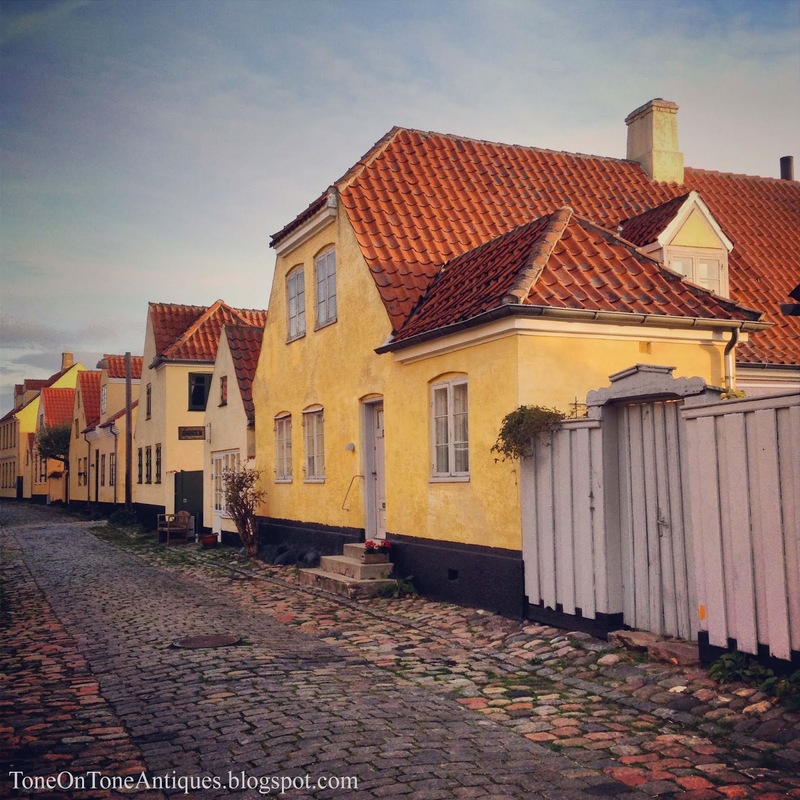 Located just outside of Copenhagen, Dragor is a historic fishing town famous for its yellow stucco homes with red roofs and cobblestone streets. Look what I found!!! 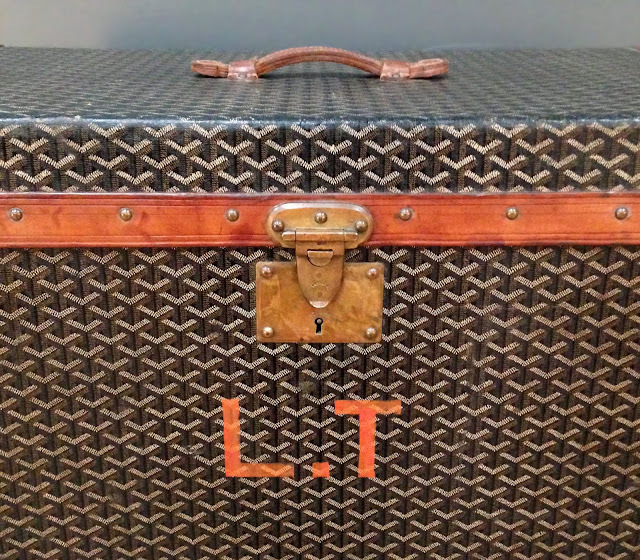 A large vintage (early 1900s) Goyard trunk with my initials. 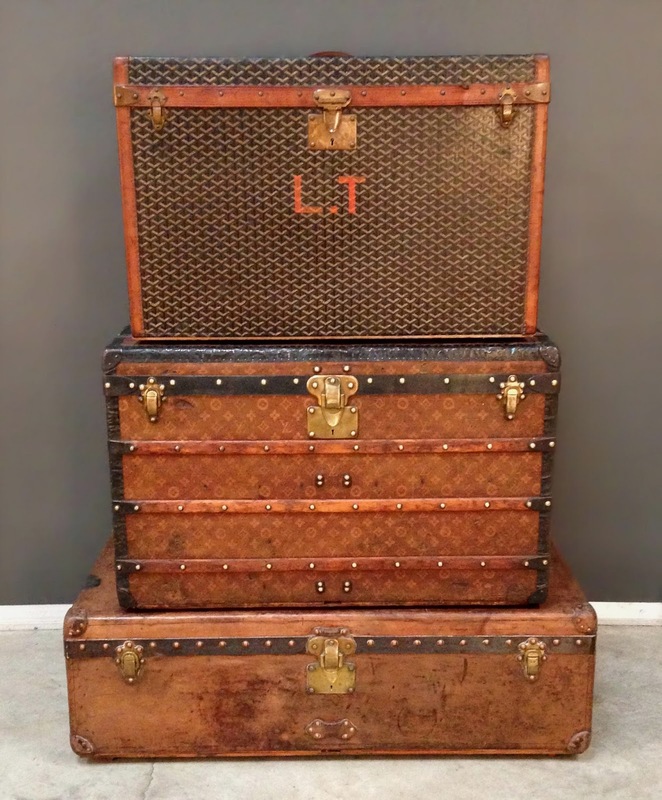 It was originally made for storing hats.....still in fantastic condition. 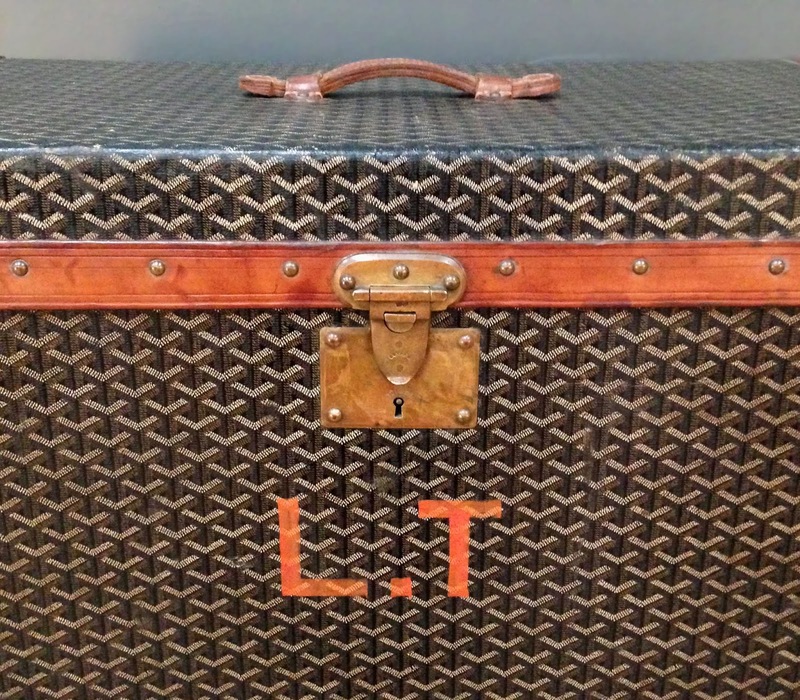 Sadly and with much disappointment, the Goyard didn't make it home with me. 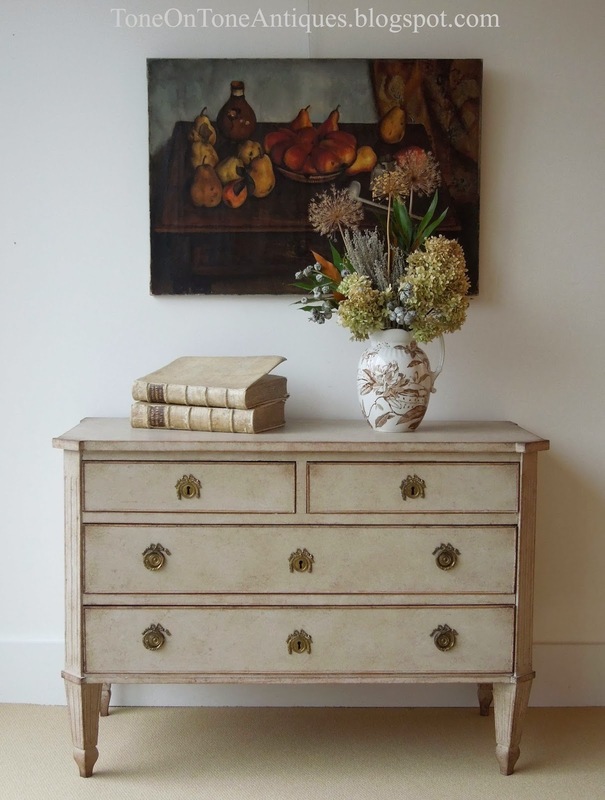 Thank you to all my Instagram friends for encouraging me to buy this beauty - you guys are the best! Let's not say goodbye on a sad note. 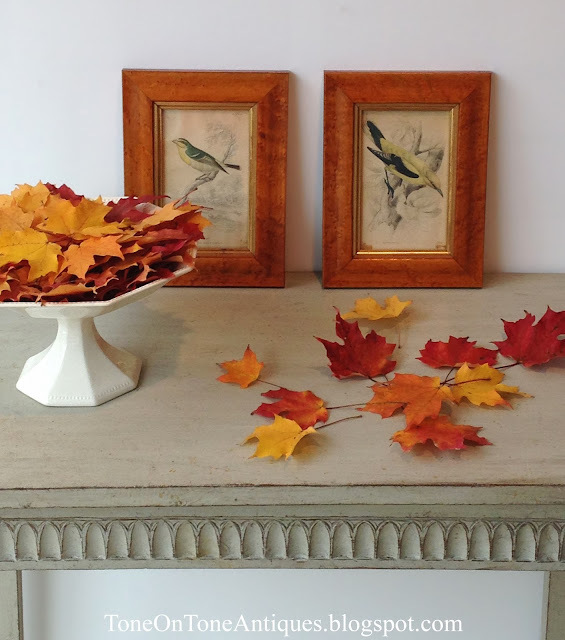 On my way to work, I gathered a bunch of fallen maple leaves to cheer up the shop for the weekend. 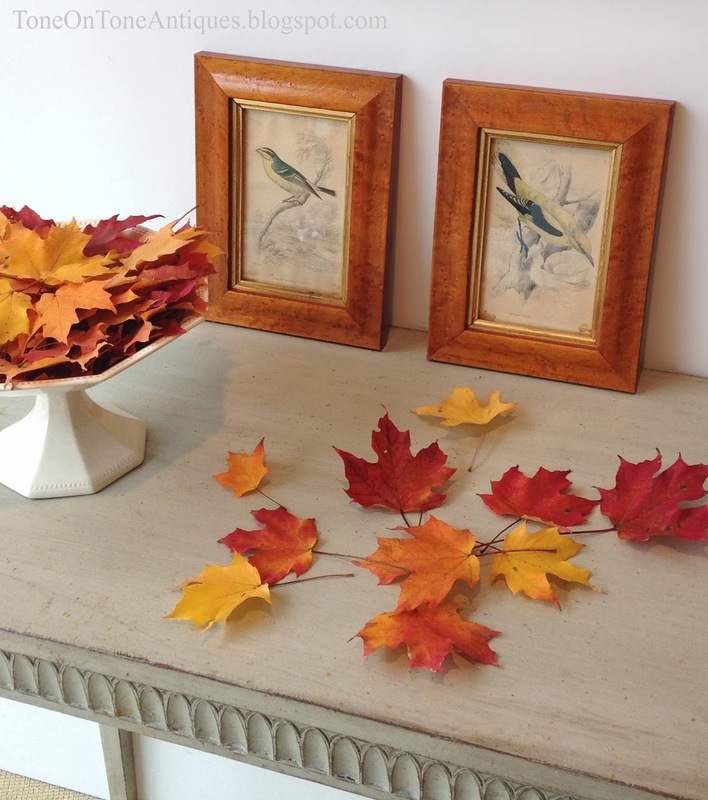 Some maple leaves to complement the maple frames on the antique bird prints. And some to fill this large footed punch bowl from the mid 1800s. 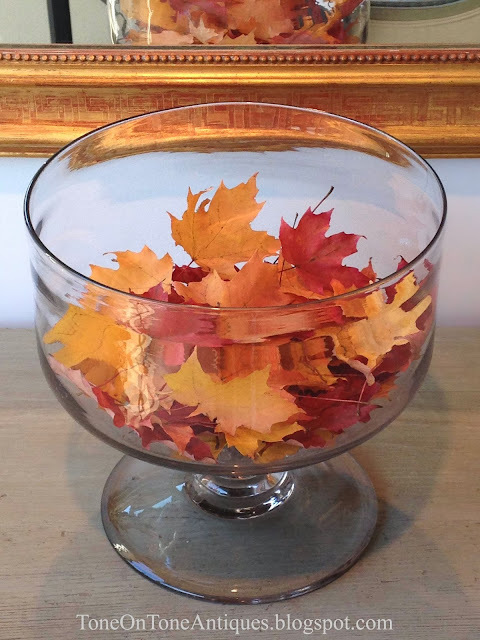 Voila - instant autumnal decor!